The 2018 Capture Photography Festival ran from April 3 to 30, and featured an outstanding mix of both local and international artists in varying photographic disciplines. We're sad it's over, but we're also glad to take some time to digest, and read this delightful re-cap! If you didn't manage to make it to these four exhibitions, at least you can now learn all about them and their innovation—and watch out for future work from these artists. Cheers! Birthe Piontek and Fei Disbrow’s show, Interspace, is concerned with the theme of spatial confusion. ‘Interspace’ already implies something liminal, interstitial and bursting with surrealism. The distortions of the human face are particularly uncanny. 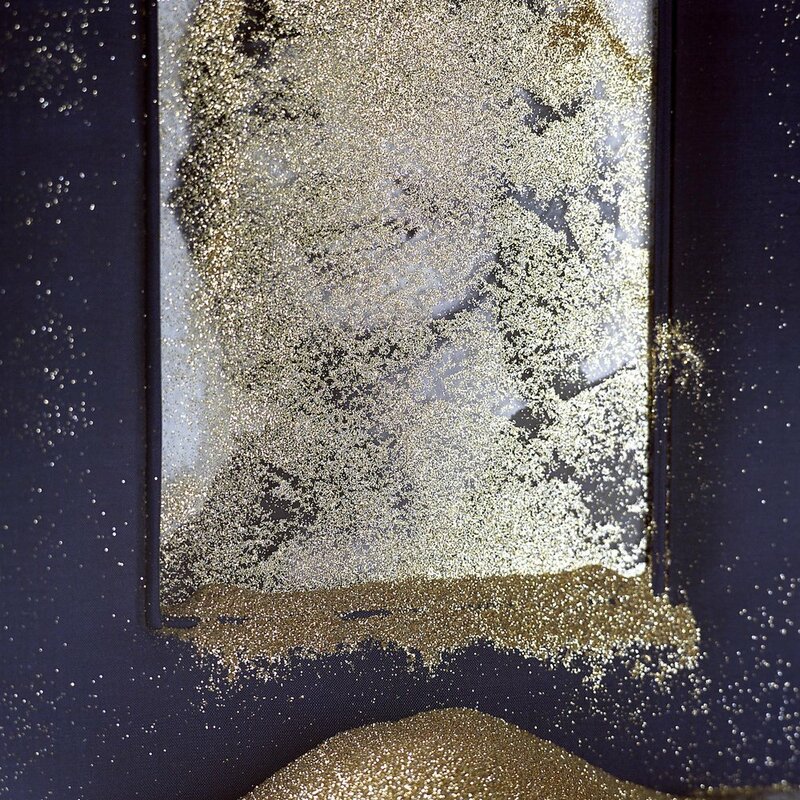 Portraiture insinuates an intimate connection to the subject, but in Birthe Piontek’s work the face is seen as a negative space, or at best a surface. These works, which gently disfigure the human head, are mesmerizing to look at. There is something about the black-and-white, old-fashioned faces that is almost haunting. It suggests that we should fade away gracefully, or not at all. One of the photographs is scratched, so as to protect the privacy of the subject. The whole oeuvre makes you wonder about the overstimulated surface of the photographic work. 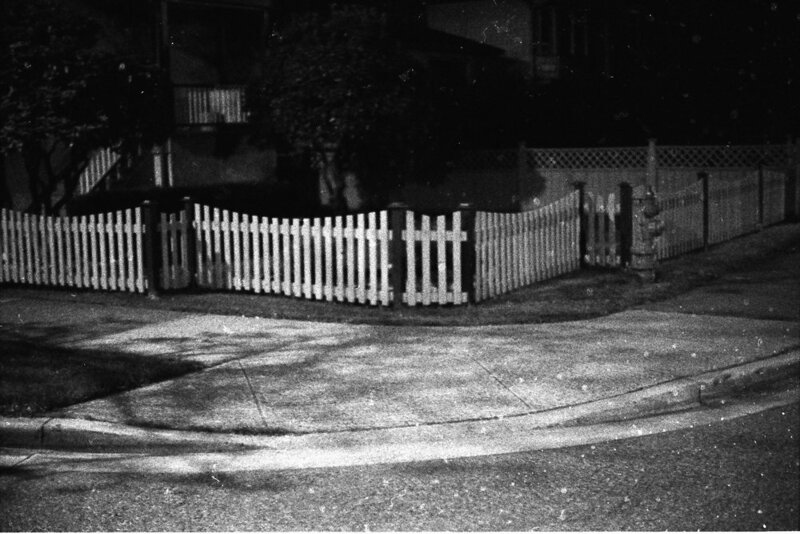 Should photographs point out their own two-dimensionality in such a direct fashion? Fei Disbrow is not ready to let us sink into suspended disbelief either. Using pastiche and collage, her works emerge bristling with texture. Disbrow’s work is crammed with layer upon layer of meaning. Her collages are at their final stage of becoming. The perfect balance has been achieved between disinterest and care, preventing the whole composition from slipping into kitsch. Back Gallery Project is positioned quite quixotically. There stands the Simon Fraser University (SFU) Visual Arts students’ campus, hidden from prying eyes, in the heart of rehabilitation centres and faceless corner stores. On the inside, it plunges immediately from somewhat gritty afternoon into comforting, high-art darkness. The first work is a screen mounted at eye-level, to make the looking much easier. Light Adjustments, a film by Scott Massey, uses stop animation movement, which brings up almost problematic feelings of nostalgia. The grass visibly grows, while the sunbeams ascend to sacred geometry. Sometimes nature can look pretty in a contrived way—but why not be picturesque? 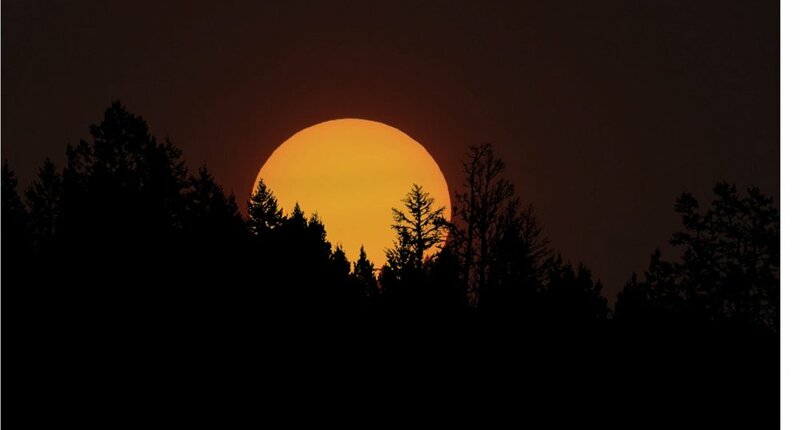 With the accompanying acoustic music, the sun becomes the main character in the acclaimed thriller of the sunset. The movement of natural forces is staged for the viewer’s aesthetic enjoyment. Then comes the strobe light sky, flashing and fading into yellow, green, and back to blue. The sky is sick with meaning, which none of us are privy to. While Scott Massey investigates speed as the one crucial difference between photography and film, Lena Mill-Reuillard tests the limits of languid visuality. Her work engages with cinematic suspension of disbelief. The photographs on the screen furtively come to life. The image of the sea projected on the roll of paper is then painstakingly rolled up into an art tube container. She masterfully plays with the expectations of reality, and then crumples the video like simple paper, in a single act of violence against form. Duplex Projects' owner is elusive; he can’t be reached by email or phone; he escapes into obscurity. The only thing left to do is send out polite inquiries, multiplied by the inability to let things go. Eventually, he relents and opens the exhibition to the public. The gallery itself is hidden in an alley, almost sign-less and singular in its desire not to be seen. Space is intimate, potentially sliding into limited. It suits the exhibition perfectly. Artist Joseph Strohan has a very idiosyncratic relationship with light. His photos are of the night and its adjacent landscapes. However, each photograph’s ephemeral space is mapped out by matches in a brutalist topography. It brings forth a pictorial humour, referencing the process of exposing negatives during the darkroom stage of a photograph’s life. They are now bathed in a potential fire. The matches themselves cast shadows in an acte de résistance against their primary function— illumination. The danger of fire is thrust into architectural abstraction. Night photography is burning with metaphors. The Chernoff Fine Art Gallery provides an ambiguous space for the exhibition of Mike McLean’s JR. Just when the end of an artwork is imminent, another piece emerges from behind the wall. Or does it? The uncertainty of the gallery space corresponds with JR’s conceptual idea. Is there something overlooked, and thus missing? Is there someone left behind in the cheerful strides towards progress? What is not seen? 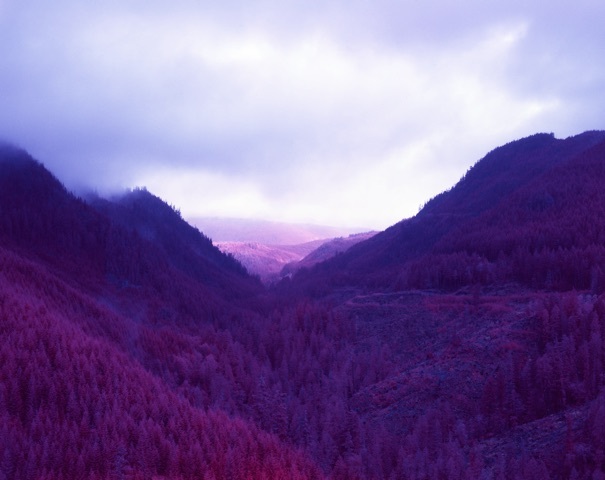 McLean’s mission is to capture the almost-infrared realities of hidden stories. The photographs glow with synesthesia that fall into the purple spatial configuration. The viewer is surrounded by venomous nature, back to back. Poisonous colours switch to black-and-white photos in white frames, on white walls. The photographs are grouped in two’s and three’s like little children trailing each other—the buddy system. However, it doesn’t seem so friendly. Nature is weaponized by chromatic means. Other photographs are leached of colour, so as to present gorgeous and crisp entropy as far as you can see. Landscape photography without any human presence always feels sinister to me. In this case, the landscape is fed up with human presence. Through the juxtaposition of selected photographs, the viewer can detect that an event has transpired here. Now only the purple forest knows what happened and what will never occur again. Unwilling? Unwitting? But very aesthetically pleasing.